This softcover edition is likely to be the definitive collection of this Atomic Age master's comic book work. Krigstein was fully conversant in multiple genres and this volume contains a full complement of his best stories. 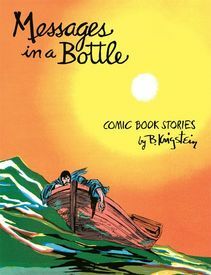 Many were previously issued in the now out of print 2004 Fantagraphics hardcover, B. Krigstein Comics. Messages includes additional stories, most notably his most famous work, the EC classic, "Master Race", fromImpact #1. All the artwork has been cleaned up, remastered for truer color reproduction and looks great as a result. The work on dislay here has exerted – and continues to exert – a tremendous influence on the development of the comics form and language. Comics apprentices and novices, along with aficionados and conoisseurs, take note.